Last fall, I decided I needed to take some time away, so I booked a long weekend to the East Coast. Flying cross country is always tough; for this trip I had to be on my airport shuttle at 4:10 am, which means getting my taxi at 3:40 am! I never get to bed before about 10 pm on nights when I am flying out the next morning, so you can imagine the sleep deprivation. It is so worth it when I get to board that plane though! My flight was direct – and absolutely uneventful. I got my car, and made my way to Annapolis; it was only about a 25-minute drive there from the airport. I stayed at the State House Inn, a historic hotel that was originally a house. There are only 7 rooms, so it is really more an inn than a hotel – without breakfast though. They do have an agreement for room service from the Italian restaurant below. The State House Inn is over 200 years old, and perhaps as old as 300 years; however, there aren’t existing records that show when the house was built. The upper stories are home/inn, and the first floor is commercial space (this floor is only visible from the back side of the house). It has undergone a variety of restorations, with the the most recent addition to the building in 1900. You can see the bones of the original building from Chancery Lane, which they say is the most photographed site in Annapolis because of the view of the illuminated dome of Maryland’s State House (you know I had to see that for myself). The alley was supposedly used by George Washington returning to Mount Vernon on December 23, 1783, after resigning his commission in the State House (there are stairs, so he must not have gotten on his horse yet). Their website indicates that it is owned and operated by Naval Academy graduate Lieutenant Commander Marc Lucas, but I talked with the manager during my stay and she had indicated that there were new owners, so it is likely that the website is outdated. For dinner, I headed across the street to the Red Red Wine Bar for a flight of wine and a charcuterie plate. The wine flights and meats and cheeses were delicious! They have a huge selection of wines by the glass and the bottle, and also have an extensive selection of whiskys, for my whisky drinker readers. The atmosphere was very nice, and the server was excellent, explaining all the flavors on the cheeses and meats so I could choose what I wanted. After my light dinner, I spent a little time wandering the quiet streets of Annapolis, looking in the shop windows, before heading back to the Inn for bed. Overall, it was a quiet evening, considering that most of the day was spent traveling. I was excited to see the sights the next day! Tonight I opened up a bottle of the Abacela 2012 Albariño. Before I got this bottle, I hadn’t heard of Abacela before, but when I saw that they had an Oregon Albariño, I just had to try it. I looked up Abacela, and discovered that it was founded by a couple from Florida, who had come to love the Tempranillo grape that made up Rioja and Ribera Del Duero wines in Spain. They learned that the United States grew very few Tempranillo grapes, and the ones there were typically ended up in cheap, California jug wines. They set out to find the perfect climate in the U.S. for Tempranillo grapes, and ended up in the Umpqua Valley of Oregon, near Roseville. But back to the Albariño. While planting their vineyards with Tempranillo, they also set out to find other under-planted grape varietals that would do well in the region. Albariño was one of those. They have been making an Albariño since 2001, and the 2012 vintage does not disappoint. Upon opening, this wine was crisp and citrusy, with flavors of green apple and lemongrass. After the wine warmed up just a bit, a hint of creamy butter began showing through, softening and enhancing the apple flavors. At either temperature, the wine has a tart kick at the back of the palate on the finish. I really enjoyed this wine – it is one that I would certainly seek out again. And after checking out the list of varietal wines on their webpage, I think we need to add Abacela to the list of wineries we need to visit. What a pleasant surprise! During our Boise road trip, we had an opportunity to taste at a couple of wineries. We were already going to be in the downtown area, and since I knew nothing about any of Idaho’s wineries, location seemed as good a criteria as anywhere to select a few to visit (you have to start somewhere right?). We visited Snake River Winery’s downtown tasting room on a super-hot Saturday in the later afternoon. Snake River is an estate winery, meaning that they grow all their own grapes in their own vineyards – they have 75 acres planted. They strive for sustainable and organic winery practices, including making their own compost from pomace (which is the solid remains of the grapes after the juice has been pressed off), eliminating pesticides and using organic fungicides. At this point, they don’t have a biodynamic certification, but are working towards it. When we walked into the downtown tasting room, it surprised me a bit that we were the only ones there. It was a great little shop with a tasting bar, and lots of cool gift items as well. Wine glasses and associated wine goodies, Snake River t-shirts, and greeting cards. Jon appreciated having some gift items to look at, as he always wanders away from the bar during a tasting. I don’t remember all of the wines we tasted that day, but I was pleased with several. The 2010 Rosé is a blend of Syrah, Grenache and Touriga Nacional. It had a light sweetness and strawberry flavor, wonderfully refreshing for a hot, summer day. Snake River Winery also makes a single varietal wine from its Touriga Nacional grapes, a bold red with strong tannins and black fruit. The grape varietal is originally from Portugal, and not often seen in the United States, at least on the West Coast. I really enjoyed this wine, and we brought home a bottle. The wine list at Snake River is extensive, with offerings that include Chardonnay, Riesling, Barbera, Grenache, Tempranillo, Sangiovese, Cab Sauvignon, Cab Franc, Merlot, Malbec, and Syrah, as well as some blends. And I was surprised to learn that they had another varietal that I had never tasted before, but unfortunately it wasn’t open that day. Blauer Zweigelt, a varietal developed in 1922 in Austria, is more widely planted in Europe, but is beginning to be planted in British Columbia as well. I’ll have to wait until another day to taste it! Perhaps the best thing about Snake River though, is the wine pairing chocolates that they offer with the heavier reds, and sell packages of! They are made from 85% Cocoa, and have a bitter dark chocolate taste that goes so well with the red wine. These chocolates, made by a company called Dream Chocolate, are fantastic, and they are even better with wine! I couldn’t resist bringing home a package of these as well! I thoroughly enjoyed our visit to Snake River, and I hope to find their wines closer to home. If you have a chance, stop in. Tonight, I’m drinking the 2008 Michael Florentino Miscolato Red Blend. 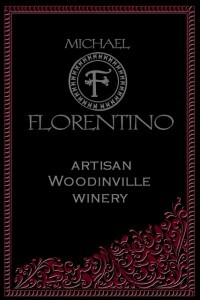 Michael Florentino is a small, boutique winery with a tasting room in the warehouse wine district in Woodinville – the first vintage was 2007. They make wine with several grapes that are not frequently seen in this area, both as blended wines and single varietals. Their approach is to create fruit forward wines with balanced tannins and light spice. Right up my alley! The Miscolato is blended with two thirds Grenache and the balance a mixture of Tempranillo, Syrah and Counoise. It is a rich Bing Cherry color, and on the nose you get heavy aromas of earth and smoke (I didn’t really pick up any fruit on this one). When you taste it, you get the same flavors of earth, smoke and a little spice, but it is balanced with the flavor of plums and black raspberry. This wine packs a punch at 14.6% alcohol, but you don’t feel overwhelmed by the alcohol when you are drinking it. I had mine after dinner, and the tannins are light enough and well balanced so you can drink it without food. This was our only bottle, purchased at the 2013 Anacortes Wine Festival, but if you find your way down to Woodinville, they are certainly worth a visit. Although sadly, you might not find the 2008 Miscolato, as they only produced 112 cases and I think they are already sold out. But they have a Cabernet! Our last full day of vacation had arrived… Well, that’s not quite true, because we had one more after that, but it was dedicated to making the all day drive from California to the very northwest corner of Washington. So anyway, our last full day of touristing was in Sacramento. We were there to visit Jon’s friend Pablo, and so Jon could enjoy his old stomping grounds. 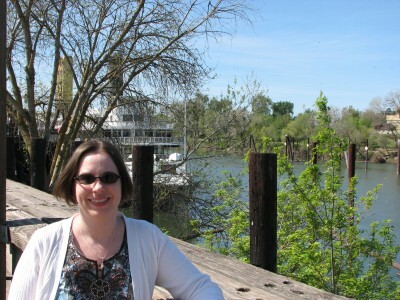 We started our day with a return trip to Old Sacramento. Jon took me there the first time we visited Sacramento before we were married. I know it is touristy, but I do enjoy the historic buildings there and the fact that they are almost all built before the turn of the 20th century. The earliest is from 1852, just after a terrible fire swept through the city. Sacramento was also prone to severe flooding, so in the early 1860s, they began the process of raising the city of Sacramento. However, they simply raised the level of the streets and not the buildings. The first floors of the buildings became a basement, and the original second floor was now at street level. There is a historic underground tour, but unfortunately, it was only on Saturdays (we were there on a Friday). 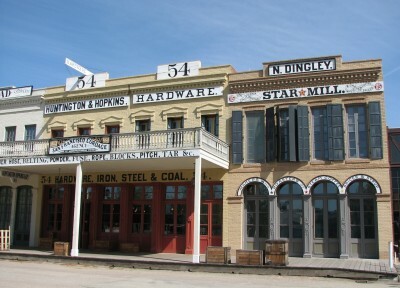 The several blocks of Old Sacramento today are part of the Old Sacramento State Historic Park. Almost all of the buildings in Old Sacramento today have been re-purposed into tourist shops and restaurants, and there is also a museum on the history of the railroad that is an excellent stop (we didn’t go this trip, but we went a couple of years ago). Jon and I had lunch in a little sandwich shop and then headed over to The Underground Tasting Room, to sample a couple of their wines. 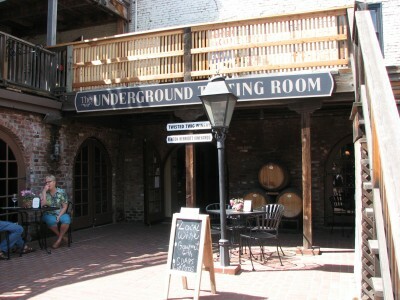 The Underground Tasting Room is shared by two wineries, Fenton Herriott Vineyards and Twisted Twig. You can choose a flight from either winery, or a combined flight with wines from both places. The tasting room is set below the current street level on the original street level of Old Sacramento, and has a little enclosed patio seating area with a fountain. It was a warm sunny day and we enjoyed just sitting in the sunshine. 2011 Chardonnay: Aged on neutral oak. It tasted of light oak and cream with an herbal finish. It just wasn’t really my style. 2012 Rose: Light flavors of cranberry and raspberry – good, but I was a bit turned off by a bitterness on the back of the throat on the finish. 2009 Merlot: This wine had a medium body and was very fruit forward with light tannins. It is ready to drink now. 2007 Twisted Twig 2007 EPIC Cabernet Sauvignon: We did get to sample one Twisted Twig wine because the Fenton Herriott Cab was unavailable. It had heavy tannins and was a very bold cab with a nice balance. It had begun softening but would hold up for a while longer. It was good, but I felt that the $38 pricetag was a bit much. 2009 Tempranillo: We ended with this wine which tasted of smoke, light cherry and coffee. It was very drinkable and delicious. Fenton Herriott is a small, family-owned winery – their wines have a production of 100 cases or less for each one. The vineyards and winery are located in Placerville, California. To be honest, I was hoping to like the Fenton Herriott Chardonnay and Rose more than I did, but I was pleased with the reds, and it would be worth a trip out to the winery when we are in the area again. We purchased a bottle each of the Fenton Herriott Merlot and Tempranillo and headed on our way to our next stop – the Leland Stanford Mansion! Tonight I’m drinking a wine that one of my coworkers brought over when we had our felting party. It is a Napa Valley Red Blend called Hey Mambo Bistro Style Wine – Sultry Red. What a name! And the description is a real kicker! A bar and tables emerge out of the SMOKY blackness. I sit in the back corner and order ravioli and a bottle of wine. On the stage, the lights reveal a LUSCIOUS gem – with COCOA brown hair and CRANBERRY lips. She belts out a lonesome note to awaken her band. Her voice like VELVET, beckoning strays to the dance floor. The music, the food, the wine, all together hypnotizing. I savor every drop. The wine is an interesting blend of 29% Syrah, 26% Petite Sirah, 13% Zinfandel, 12% Grenache, 10% Tempranillo, 6% Cabernet Sauvignon, and 4% Merlot. The wine is a deep garnet color. The nose is of raspberry and light smoke. On the palate, it is very fruit forward with light tannins and a hint of that same smoke. I enjoyed it both with food and on its own. It retails for about $10, and while it won’t knock your socks off, it is a smooth drinking, everyday wine that will satisfy your guests. So, it’s one week until closing. We are just waiting, and getting the last bit of our packing finished. Our financing has been finalized for weeks, so other than packing, we really haven’t had a lot to do. Our buyer, however, is still not ready to go with her financing and it is making me nervous. Her mortgage officer is trying to reassure our agent that everything will be ready to go by closing, but I’m still nervous. I can’t understand why it should be taking so long if things are happening as they should. So, in the meantime, I’m trying not to think about it. Yes, I’ll admit it – I try to be very organized about these things, and it annoys me to no end when other people are not, if it affects my world. And this certainly affects my world. I have been a bit absorbed with this whole home process lately, and my wine and travel blog has been suffering. We haven’t had time to do much wine tasting! I’m looking forward to turning that around once we move and get some semblance of a normal life back. That said, we did do a local mini-tour last weekend in honor of harvest weekend with Jon’s mom and sister. We went to two local wineries – Willow Tree and Glacial Lake Missoula. Willow Tree Vineyards is a new winery in the area, having opened their tasting room in April. As you drive in, it certainly doesn’t look like much. There is a ramshackle single-wide trailer on the driveway to the winery, and the winery itself is housed in a non-descript pole building. Which isn’t that uncommon for wineries in this area. Don’t let that deter you. Once you walk inside, the tasting room is tastefully decorated, with a fireplace, comfy seating, and a stand-up tasting bar. They also have had chocolates and cheese and crackers out each time I’ve been there, which is a huge bonus. I’m usually hungry in the afternoon, and the nibbles are great to hold me over until dinner. The co-owner is usually serving, and she is warm and friendly and knowledgeable about their wines. It is a winery where you feel welcome! Willow Tree has several whites, including a Sauvignon Blanc, two vintages of Chardonnay and Viognier, and a Pinot Gerwurztraminer. My favorite of these is the Sauvignon Blanc, which has a crisp minerality that I enjoy. Jon likes their more heavily oaked Chardonnay. Willow Tree is currently having a labeling issue with the ATF (Alcohol, Tobacco and Firearms agency) on their “waiting to be released” Blue Heaven, which is a Blueberry Riesling. Yes, Riesling combined with Blueberry juice. We got to barrel taste it, and it was delicious. Which makes the fact that the ATF has now rejected 7 versions of the label especially frustrating for Jon’s mom and me, as we have to continue to wait to buy it! Willow Tree also has several good reds, including a Carmenere, Syrah, and Cabernet Franc. Unfortunately, all the reds are currently sold out except for the Cab Franc. So, we are eagerly awaiting next year’s releases. What a nice problem for a new winery to have! After we left Willow Tree, we headed out to Blaine to visit our favorite local winery, Glacial Lake Missoula. Tracey was holding down the fort with a friend, as Tom took a trip down to Oregon to pick up grapes. They are branching out and producing a Chardonnay and a Gamay Noir. I’m very excited about both. The Chardonnay will be another “enrobed” wine, which is Tom’s name for a white wine that is colored (and flavored) with the skins of red grapes. A white wine that looks like a red. And depending on the temperature you serve it at, it can taste completely different. Their current “enrobed” wine is a Marsanne, which is excellent, so I can’t wait to see what they do with the Chardonnay. And Gamay Noir is one of my favorite varietals, so I’m super-excited to try this one. Of course, as they are just crushing now, both wines have awhile until release. It is just so hard to wait! I’m sensing a theme with this post. Waiting…. One of my least favorite things to do. Hopefully in one more week, the wait for the house will be over. Stay tuned. P.S. After posting this, I learned that our buyer’s loan docs are finalized and at the title company! So everything should be good to go now!